The pilot of a tailwheel-equipped airplane reported about 4 seconds into the landing roll the airplane veered to the left despite full rudder deflection applied to the right. The pilot further reported that he added power to correct for the deviation, but the airplane continued to the left, departed the runway, and ground looped. During the ground loop, the right main landing gear collapsed and the right wing was substantially damaged. The pilot's failure to maintain directional control during the landing roll, which resulted in a runway excursion, ground loop, right main landing gear collapse, and substantial damage to the right wing. 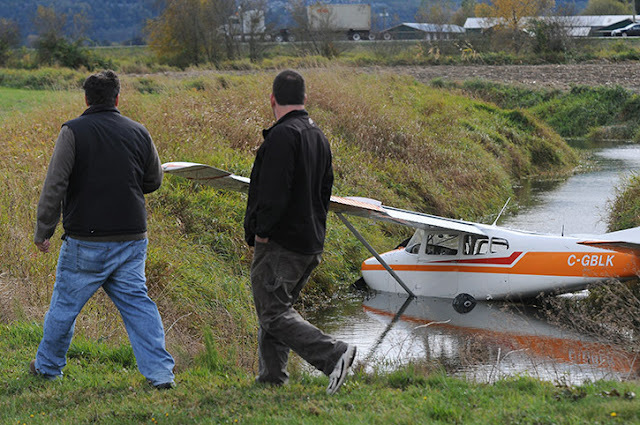 People check out a plane that crashed while landing at the Chilliwack Airport on October 20, 2012. 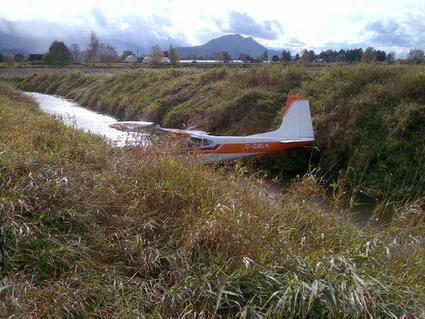 A Cessna 180 plane slid off the runway and into a ditch at Chilliwack Airport on October 20, 2012. Chris Gatsin witnessed the incident, and told Global BC he saw the plane flip a few times. However, Wilkins said the plane did not flip. Four people were on board, including the pilot, and all climbed out of the aircraft on their own. Wilkins said they were checked at the scene by an ambulance, and were then released. A crane was brought out to lift the aircraft out of the ditch, and it was then taken to a local maintenance shop. 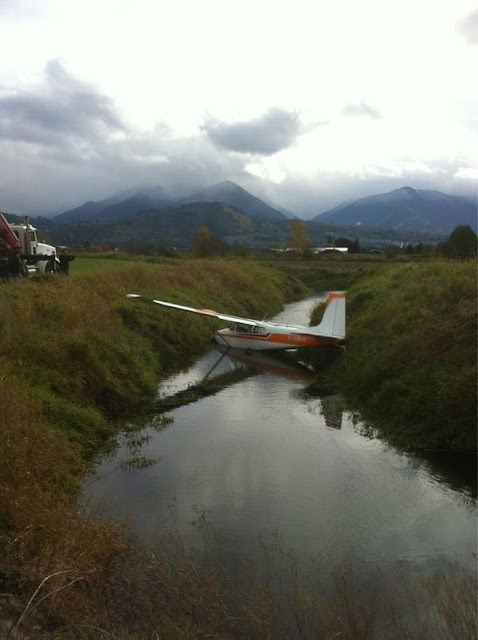 CHILLIWACK (NEWS1130) - A small plane has crashed while landing at Chilliwack Municipal Airport. "I was just driving along the freeway and I saw the plane approaching from the east and all of a sudden it went sideways -- there's quite a heavy crosswind here -- and it cartwheeled into the drainage ditch. I saw the two wings break off," he explains. "[It] looked pretty horrific... to see the water spay and the wings break off," he adds. "The first thing I did was pull over and call 9-1-1 and report it. Shortly after, maybe a minute, I saw two people climb out over the bank onto the drainage canal, and a few minutes later two more got out." BC Ambulance Service and Chilliwack RCMP both attended the scene. No official word on any injuries. AIRCRAFT LANDING GEAR COLLAPSED UNDER UNKNOWN CIRCUMSTANCES, GAINESVILLE, TEXAS. AIRCRAFT WHILE HOLDING ON RUNWAY, WAS STRUCK BY JET BLAST OF PASSING B737, AND IMPACTED THE RUNWAY, JOHN WAYNE-ORANGE COUNTY AIRPORT, SANTA ANA, CALIFORNIA. UNREGISTERED ULTRALIGHT ON LANDING SUSTAINED UNKNOWN DAMAGE, BROOKSVILLE, FLORIDA. The commercial pilot reported that, during the landing roll following a normal touchdown in variable, gusting wind conditions, the airplane veered slightly to the left as she applied brakes, and she corrected with right rudder. She applied brakes a second time, and the airplane again veered left but did not respond to brake or rudder control inputs. The airplane exited the left side of the runway and struck a runway distance remaining sign, resulting in substantial damage to the left wing and left horizontal stabilizer. Postaccident examination of the airplane revealed no preaccident mechanical anomalies with the airframe or landing gear components that would have precluded normal operation. Given the lack of mechanical anomalies found, it is likely that the pilot lost control of the airplane during the landing roll. The pilot's loss of directional control during the landing roll, which resulted in a runway excursion. On May 13, 2016, about 1415 Pacific daylight time, a Cessna 172RG airplane, N6281V, sustained substantial damage following a loss of control and runway excursion at the North Las Vegas Airport, Las Vegas, Nevada. The commercial pilot was not injured. The airplane was registered to Black Ridge Partners, LLC and was operated by the pilot as a personal flight under the provisions of 14 Code of Federal Regulations Part 91. Visual meteorological conditions prevailed and no Federal Aviation Administration flight plan had been filed for the flight. The pilot reported that following a normal touch down in variable gusty wind conditions, while braking to slow to taxi speed, the airplane veered slightly to the left, and she corrected with right rudder. Then while braking again, the airplane veered to the left, and did not react to brake or rudder control inputs. Subsequently, the airplane exited the left side of the runway and struck a runway distance remaining sign, resulting in substantial damage to the left wing and left horizontal stabilizer. Examination of the airplane by a Federal Aviation Administration inspector revealed no preaccident mechanical anomalies with the airframe or landing gear components that would have precluded normal operation. The pilot reported that following a normal touch down, the airplane veered slightly to the left, and she corrected with right rudder. Then the airplane veered to the left again, and did not react to brake or rudder control inputs. Subsequently, the airplane exited the left side of the runway and struck a runway distance remaining sign, resulting in substantial damage to the left wing and left horizontal stabilizer. A detailed examination of the airframe is pending. DESCRIPTION OF ACCIDENT: Veered off runway and struck a sign. This caused the gear to collapse. DESCRIPTION OF DAMAGES: The damages are to the propeller, cowling, gear and wing. AIRCRAFT LANDED GEAR UP, RIVERSIDE, CALIFORNIA. Injuries: 1 Serious, 5 Minor. During the landing approach at the conclusion of the sightseeing flight, the commercial pilot of the balloon began a “quick” descent from an altitude of about 500 ft in order to land in a field that was about ¼ mile away. The pilot then activated the burners in order to slow the balloon’s descent rate. About 50 ft above the ground, the pilot turned off the burners and pulled the quick deflation port at the top of the envelope. The basket impacted the ground, and the pilot and one passenger were ejected from the basket. The pilot continued to hold onto the quick deflation port line, and was dragged alongside the basket as the balloon subsequently became airborne. The balloon continued across the field until it contacted trees and came to rest. The pilot reported there were no mechanical malfunctions or anomalies with the balloon that would have precluded normal operation. The pilot’s failure to control the balloon’s descent rate during the landing approach, which resulted in a hard landing. On May 13, 2016, about 0800 central daylight time, a Cameron Balloon US Z-150, N6952D, collided with trees and the terrain during a landing in Edmond, Oklahoma. The pilot and four passengers received minor injuries. One passenger was seriously injured. The balloon received substantial damage to the envelope. The balloon was registered to a private individual and was operated by OKC Balloons Aloft as a sightseeing flight under the provisions of 14 Code of Federal Regulations Part 91. Visual meteorological conditions prevailed and no flight plan was filed. The local flight originated about 0705. The pilot stated he checked the weather prior to the flight and the wind speed was forecast to be 5 to 8 knots. They departed on the flight and during the landing approach, at an attitude of about 500 ft, he started a "quick" descent to land in a field that was about ¼ mile away. He realized the descent rate was too fast so he used the burners to slow the descent. At 50 ft above the ground, the pilot stopped using the burners and pulled the quick deflation port. The basket impacted the ground, and the pilot and one passenger were ejected from the basket. The pilot continued to hold onto the quick deflation port line and was drug alongside the basket. The balloon became airborne and ascended to a height of 75 to 100 ft above the ground, with the pilot still holding onto the line. The balloon continued across the field until it came to rest after contacting trees. The pilot reported that there were no mechanical malfunctions during the flight. The pilot's safety recommendation was, "Use of a pilot restraint harness so pilot is not ejected." On May 13, 2016, about 0750 central daylight time, a Cameron Balloon US Z-150, N6952D, collided with trees and the terrain during a landing in Edmond, Oklahoma. The pilot and four passengers received minor injuries. One passenger was seriously injured. The balloon received substantial damage to the envelope. The balloon was registered to a private individual and was operated by OKC Balloons Aloft as a sightseeing flight under the provisions of 14 Code of Federal Regulations Part 91. Visual meteorological conditions prevailed and no flight plan was filed. The local flight originated about 0700. SPIRIT AIRLINES FLIGHT NKS217 AIRBUS A320 AIRCRAFT WHILE PARKED AT THE GATE DEPLANING PASSENGERS, THE JETBRIGE STRUCK THE AIRCRAFT DOOR, NO INJURIES, DAMAGE IS MINOR, LOS ANGELES, CALIFORNIA. The private-rated pilot was taking off in the airplane when the airplane's engine began to sputter and lose power. He elected to reduce engine power and land on the remaining runway; however, he had already retracted the landing gear. The pilot lowered the landing gear handle, but was not able to lock the gear into place before the airplane impacted the runway and the nose gear collapsed. Postaccident examination of the airplane found water in the left and right wing fuel tanks, as well as the engine’s carburetor. It is likely that the loss of engine power was a result of the water contamination of the fuel system. A loss of engine power due to water contamination of the fuel. On May 13, 2016, about 0930 central daylight time, a Mooney M20F airplane, N6371Q, conducted a forced landing while departing the North Little Rock Municipal airport (KORK), near Little Rock, Arkansas. The private rated pilot and passenger were not injured, and the airplane was substantially damaged during the accident. The airplane was registered to and operated by Barefoot Aviation LLC, Little Rock, Arkansas, under the provisions of 14 Code of Federal Regulations Part 91 as a personal flight. Day visual meteorological conditions prevailed at the time of the accident. The pilot reported to the responding Federal Aviation Administration (FAA) inspector, that after takeoff, about the time he retracted the landing gear, the engine started to "sputter". The pilot lowered the landing gear and tried to land and stop on the remaining runway. However, the airplane landed hard on the nose gear and the nose gear collapsed. The airplane came to rest just off the end of the runway. The airplane sustained damage to the nose of airplane, including substantial damage to the firewall. The airplane was moved back to the owner's hangar, and remained there, until the insurance company sold the wreckage. The new owner recovered the airplane and had the airplane transferred to a maintenance facility. Personnel at the maintenance facility reported that during recovery of the airplane, water was found in the left and right fuel tanks. Additionally, water was found in the engine's carburetor. On May 13, 2016, about 1030 central daylight time, a Mooney M20F airplane, N6371Q, conducted a forced landing after departing the North Little Rock Municipal airport, near Little Rock, Arkansas. The private rated pilot and passenger were not injured, and the airplane was substantially damaged during the accident. The airplane was registered to and operated by Barefoot Aviation LLC, Little Rock, Arkansas, under the provisions of 14 Code of Federal Regulations Part 91 as a personal flight. Day visual meteorological conditions prevailed at the time of the accident. The pilot reported to the responding FAA (Federal Aviation Administration) inspector, that during takeoff, about the time he retracted the landing gear, the engine started to "sputter". The pilot lowered the landing gear and tried to stop on the remaining runway. However, the airplane landed hard on the nose gear, the nose gear collapsed, and the airplane came to stop just off the end of the runway. 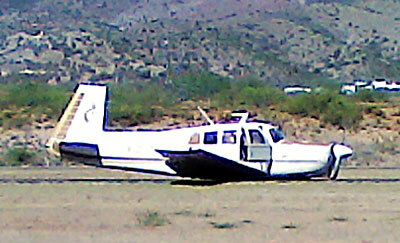 AIRCRAFT LANDED GEAR UP AND STRUCK THE PROPELLER, COTTONWOOD, ARIZONA. A Cottonwood pilot escaped injury after he forgot to lower the landing gear on his Mooney M20G aircraft Monday morning. Cottonwood police and fire were called to the Cottonwood Airport on a report of an airplane crash at 9:58 a.m. Monday, according to a news release from the City of Cottonwood. On arrival, units found the aircraft sitting on runway 32, the news release stated. The pilot, James Gray of Cottonwood, was out of the plane and said that he was unhurt. According to the city's news release, Mr. Gray said that as he was landing on runway 32, he forgot to lower his landing gear. The aircraft landed and skidded about 585 feet before coming to a stop. The plane sustained damage to the undercarriage and to the prop. The plane was lifted up by a crane and the gear was lowered. The plane was then towed off the runway. The investigation will be handled by the National Transportation Safety Board. The airport runway was closed for about one hour before reopening. An airplane crashed at Cottonwood Airport on Monday morning after a pilot forgot to lower the landing gear as he came in for a landing, Cottonwood city officials said. Cottonwood police and fire officials responded to a report of a Mooney M20G airplane crash about 10 a.m. Monday and found pilot James Gray, of Cottownwood, unhurt, according to a city press release. Gray's plane skidded about 585 feet before it came to a stop, sustaining damage to the undercarriage and prop, officials said. The plane was towed away, and the runway was closed for about an hour before reopening, officials said. The crash investigation will be handled by the National Transportation Safety Board. AIRCRAFT ON LANDING WENT OFF THE RUNWAY, STRUCK A SIGN AND LIGHTS, DEER VALLEY AIRPORT, PHOENIX, ARIZONA. AIRCRAFT FORCE LANDED IN A MARSH, CURRITUCK COUNTY, NORTH CAROLINA. AIRCRAFT LANDED GEAR UP, MARYSVILLE, CALIFORNIA. According to the pilot, shortly after he climbed above the tree tops during the takeoff initial climb, he determined that he was uncomfortable flying in the gusting wind conditions. He reported that he completed one traffic pattern and made an approach to runway 31. He recalled that during the landing flare, the airplane encountered a wind gust and was blown to the right, and off of the runway. The pilot reported that the airplane touched down in the safety area on the right side of the runway and the airplane impacted a drainage culvert where it came to rest. The airplane sustained substantial damage to the firewall and the right wing spar. The pilot reported that there were not any pre-accident mechanical failures or anomalies with the airplane that would have precluded normal operation prior to the accident. The pilot's failure to maintain directional control during the landing in variable direction and gusting wind conditions, resulting in a landing off the side of the runway and impact with a drainage culvert. The private pilot and the passenger, a friend who was previously a student pilot but never completed his training, were making their first flight together. The pilot, who sustained serious injuries, did not recall the accident. The passenger reported that the pilot took off from the departure airport and then transferred the controls to him and let him fly for a while. They flew to another airport, and the pilot made one touch-and-go landing on runway 36. During departure, the pilot again transferred control to the passenger and stated, "you make the next landing and I will watch you." The passenger reported that he was trying to fly the airplane straight to the runway but drifting left due to a quartering tailwind, which was reported as 14 knots, gusting to 22 knots. The passenger tried to correct the flight path but was unable to align the airplane with the runway centerline. He did not remember if the pilot tried to help or not at any point before the airplane impacted the ground. The airplane came to rest near midfield and about 340 ft left of the runway edge. Examination of the wreckage did not reveal evidence of any preimpact mechanical malfunctions that would have precluded normal operation. The pilot's (left front seat's) shoulder harness was torn in half at its midpoint. The distal 24 inches (the portion that did not normally retract into the inertia reel) of the webbing showed significant discoloration, fading, and stiffness. A significant section of abrasive wear was noted on the edges of the webbing about 15 to 21 inches from the distal end fitting; the shoulder harness separated in this worn section. The passenger's (right front seat's) shoulder harness was also discolored, faded, and stiff. The manufacturer's maintenance manual for the airplane stated that an inspection of the seat belts is required during the annual and/or 100-hour inspection. The manual indicated that the belts are to be replaced if deteriorated or worn. Review of the airplane's maintenance logbooks found no records indicating that the seat belts were ever inspected or replaced. If the pilot's shoulder harness had been replaced, it would likely have secured him in his seat and minimized the severity of the injuries that he incurred. The pilot's improper decision to allow the passenger to attempt a landing, which resulted in a loss of control during landing with a quartering tailwind. Contributing to the severity of the pilot's injuries was the separation of the deteriorated shoulder harness. On May 16, 2016, about 1646 eastern daylight time, a Piper PA-28-140, N7031R, impacted terrain during landing at Homestead General Aviation Airport (X51), Homestead, Florida. The airplane sustained substantial damage; the private pilot was seriously injured, and the passenger sustained minor injuries. The airplane was registered to and operated by the pilot as a personal flight conducted under the provisions of 14 Code of Federal Regulations Part 91. Visual meteorological conditions prevailed, and no flight plan was filed for the flight that departed Miami Executive Airport (TMB) en route to X51. The pilot's wife reported that he does not have any recollection of the accident. The passenger stated that the pilot was a friend of his, and the accident flight was their first flight together. The passenger also stated that he was previously a student pilot but never completed his training and let his medical certificate expire. Soon after departing TMB, the pilot transferred control to passenger and let him fly around and make a couple of turns before he transferred control back to the pilot. They flew to X51, and the pilot made one touch-and-go landing. During departure, the pilot transferred control to the passenger and stated, "you make the next landing and I will watch you." According to the passenger, the pilot then asked him if he wanted "one notch" of flaps, which equated to 10° flap extension, and the passenger responded that he did. The passenger reported that he was trying to fly the airplane straight to the runway, but it kept drifting left due to the quartering tailwind. The passenger tried to correct the flight path but could not get the airplane aligned with the centerline of runway 36. The passenger further stated that he was having difficulty controlling the airplane and did not remember if the pilot tried to help or not. The passenger recalled the airplane veering to the left of the runway centerline and the ground coming up on them quickly. He then braced for impact. According to Federal Aviation Administration (FAA) records, the pilot held a private pilot certificate with an airplane single-engine land rating, which was issued on May 4, 2012. He also held an FAA third-class medical certificate, issued September 23, 2015. At the time of the medical examination, the pilot reported 2,100 total hours of flight experience. The pilot's logbook could not be located. According to FAA records, the passenger held a student pilot certificate. He also held an FAA first-class medical certificate, issued December 4, 2014. At the time of the medical examination, the passenger reported no hours of flight experience. The student pilot's logbook could not be located. The four-seat, low-wing, fixed-tricycle-gear airplane was manufactured in 1966. It was powered by a 150-horsepower Lycoming O-320-E2A engine and equipped with a two-bladed, fixed-pitch Sensenich propeller. A review of maintenance records revealed that the airplane's most recent annual inspection was completed on September 20, 2015. At that time, the airframe had accumulated 3,630 total flight hours, and the engine had accumulated 1,453.7 flight hours since major overhaul. The 1645 recorded weather at X51 was wind from 120° true at 14 knots, gusting to 22 knots, visibility 10 statute miles, temperature 29°C, dew point 23°C, and altimeter setting 30.07 inches of mercury. Examination of the accident site revealed that the wreckage was located near midfield and about 340 ft off the left side of runway 36. Ground scars that corresponded with damage to the airplane's left-wing tip were between the runway and a canal. Another ground scar that corresponded to damage to the propeller was located on the far bank of the canal. The ground scars were orientated on a heading of 295°. The airplane came to rest on a heading of 200° about 40 ft from the canal bank. The nose gear was bent aft, and both main landing gear were sheared off. Cable continuity was established to all flight controls. The left-wing tank was full of fuel, and the right wing tank was half-full of fuel. The fuel was consistent in color and odor to 100LL aviation type gasoline and had no visible signs of water contamination. The nose section of the airplane was crushed down and aft, and the engine was tilted up about 30°. The left wing main spar was fractured at the fuselage, and the rear attachment point bolt separated and was not located within the wreckage area. The left wing pulled away from the fuselage about 6 inches but remained attached to the flap torque tube assembly. The flaps were in the 10° position. The ailerons, fuselage, and right wing were intact. The fuel selector was selected to the left tank. Both control yokes were bent to the right and downward. The left front seat's (pilot's) shoulder harness was torn in half at its midpoint. The aft attachment points of the pilot's seat remained attached to the seat rails; however, the forward attach points were separated from the seat rails, consistent with impact forces. The right front seat's (passenger's) shoulder harness was intact, and the seat was attached at all four corners to the seat rails. The left and right front seatbelts and shoulder harnesses were retained for further examination by an NTSB survival factors specialist. The shoulder harnesses were manufactured by Pacific Scientific, and the lap belts were manufactured by Davis Aircraft Products, Inc. Both shoulder harnesses were equipped with an inertia reel and an end fitting designed to secure to a standoff button on the separate lapbelt, and the belt webbing's total extended length was about 53 inches. The left shoulder harness webbing retracted normally into the inertia reel. The distal 24 inches (the portion that did not normally retract into the inertia reel) of the webbing showed significant discoloration and fading. The yellowed material in the discolored area was noticeably stiffer and less pliable than the material that retracted into the inertia reel, which appeared to be black in color. Some minor wear was noted on the edges of the webbing that retracted into the inertia reel, and there was a 6-inch section of significant abrasive wear about 15 to21 inches from the distal end fitting. In this section, about 6 longitudinally woven threads (or 1/8 inch) were compromised at the wear's deepest intrusion into the webbing. A complete transverse, frayed separation of the webbing was present at the point of deepest intrusion, about 20 inches from the distal end fitting. The webbing of the right shoulder harness did not retract normally into the inertia reel and about 48 inches of webbing remained exposed. The distal 44 inches of the webbing showed discoloration and fading and appeared an orangish color. The discolored material was slightly stiffer and less pliable than the webbing of both lapbelts, but less so than the webbing of the left shoulder harness. The most significant area of discoloration appeared between 14 and 42 inches from the distal end fitting. There was very minor abrasive wear on the edges of a small portion of the webbing that would normally have retracted into the inertia reel, but no thread integrity was compromised. There was no noted wear to the edges of the remainder of the webbing. Both the lapbelts were in good condition, and the buckles functioned as designed. The webbing was appropriately supple and showed no evidence of fading or damage. The adjustable, insert tab portions of the belts were in similarly good condition. They were adjusted to a length of about 34 inches. The manufacturer's maintenance manual for the airplane stated that an inspection of the seat belts is required during the annual and/or 100-hour inspection. The manual indicated that the belts are to be replaced if deteriorated or worn. Review of the airplane's maintenance logbooks found no records indicating that the seat belts were ever inspected or replaced. On May 16, 2016 about 1646 eastern daylight time, a Piper, PA-28-140, N7031R was substantially damaged when it impacted terrain during landing at Homestead General Aviation Airport (X51), Homestead, Florida. The private pilot was seriously injured and the passenger received minor injuries. The airplane departed from Miami Executive Airport (TMB), Miami, Florida. Visual meteorological conditions prevailed and no flight plan was filed for the planned flight to X51. The airplane was registered to and operated by a private individual as a personal flight conducted under the provisions of Title 14 Code of Federal Regulations Part 91. The passenger stated that the pilot was a personal friend and this was their first flight together. The passenger also stated he was a student pilot, but never obtained his pilot certificate and he currently did not have a medical certificate. He added that soon after departing TMB, the pilot transferred control to the passenger and let him fly around, making a couple turns and then the passenger gave controls back to the pilot. The passenger stated they flew to X51 and the pilot made one touch-and-go landing and during departure, the pilot transferred control over to the passenger and stated "you make the next landing and I will watch you." The pilot then asked the passenger if he wanted "one notch" of flaps which equated to 10 degrees of flap extension, in which the passenger stated he did want "one notch" of flaps. The passenger was trying to fly the airplane straight to the runway, but kept getting blown to the left side. The passenger tried to correct the flight path, but could not get the airplane back on the centerline of the approach to runway 36. The passenger further stated he was having difficulty controlling the airplane and did not remember if the pilot tried to help or not. The passenger did not know how they got so far off the centerline of the runway and heading 90 degrees from the centerline of the runway. He remembered the ground coming up on them quickly and he braced for impact. Examination of the airplane at the accident site revealed that the wreckage was located to the left side of runway 36, approximately 340 feet away and midfield. The direction of flight was 295 degrees magnetic and the airplane came to rest oriented about 200 degrees magnetic. There were ground scars between the runway and a canal that corresponded with damage to the left wing tip. Orange paint chips were located in the grass and ground scars. The airplane had proceeded across the water and impacted the bank on the edge of the water. The propeller contacted the bank first, which bent one blade aft and stopped the engine from rotating further. During the impact, the nose gear bent aft and both main landing gear were sheared off. The airplane then slid approximately 40 feet to its final resting spot. The left wing tank was full of fuel and the right wing tank was half full of fuel. The fuel was clean and no water was present. The nose section of the airplane was crushed and the engine was tilted up about 30 degrees. The left wing main spar was fractured at the fuselage and the rear attachment point bolt separated and was missing. The left wing pulled away from the fuselage approximately 6 inches, but still remained attached to the flap torque tube assembly. The flaps were in the neutral position, but the flap handle was in the first detent, which equated to 10 degrees of flap extension. The ailerons, fuselage and right wing were intact. The fuel selector was selected to the left tank. Both control yolks were bent to the right side and downward. The pilot's shoulder harness was torn in half at the mid-point of the belt. The pilot's seat was separated from the seat rails, consistent with impact forces. The passenger's shoulder harness was intact and his seat was attached at all four corners of the seat rails. SOUTHWEST MIAMI-DADE, Fla. (WSVN) -- A man is being airlifted to the hospital after a small plane made a rough landing on the edge of the Florida Everglades, Monday afternoon. According to Miami-Dade Fire Rescue, the single-engine Piper went down near Southwest 287th Street and 187th Avenue in Southwest Miami-Dade. Witnesses said the plane was attempting to land at Homestead General Aviation Airport when it was carried away by strong winds. The aircraft then went past the runway and over a canal before landing on its belly. According to officials, two people were on board, and rushed to the hospital. One person was transported via air rescue, while the other was transported via ground rescue. 7Skyforce HD captured the victim being put in a helicopter by paramedics. He is being taken to an area hospital as a trauma alert. The plane sustained serious damage to the nose. Two people were injured when a small plane made a rough landing near a Homestead airport Monday. The incident was reported in the 28700 block of Southwest 217th Avenue. Officials said two people, a pilot and passenger, were on board the single-engine Piper plane when the pilot lost control during landing. 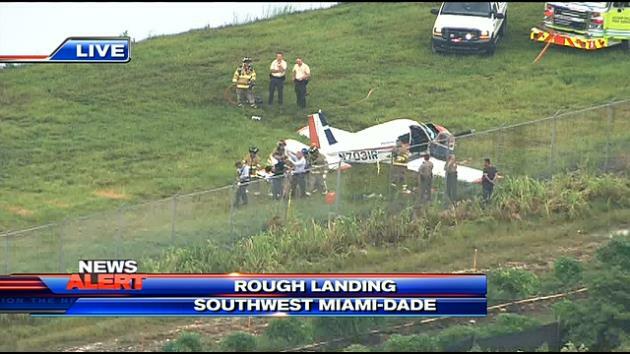 Footage showed the small plane in a grassy area next to a canal near Miami-Homestead General Aviation Airport. One person was airlifted to Jackson South while the other person was taken by ground, Miami-Dade Fire Rescue officials said. A small plane landed hard, bouncing along Runway 36 at Homestead General Aviation Airport Monday afternoon, before stopping near a canal, federal officials said. A separated tire could be spotted about six feet from the plane, which also was split in the front. A Miami-Dade Fire spokeswoman confirmed that two people on board were taken to the hospital — one of whom was airlifted as a trauma alert. The plane went down at about 4:45 p.m. at 28700 SW 217th Ave., at the Homestead airport. 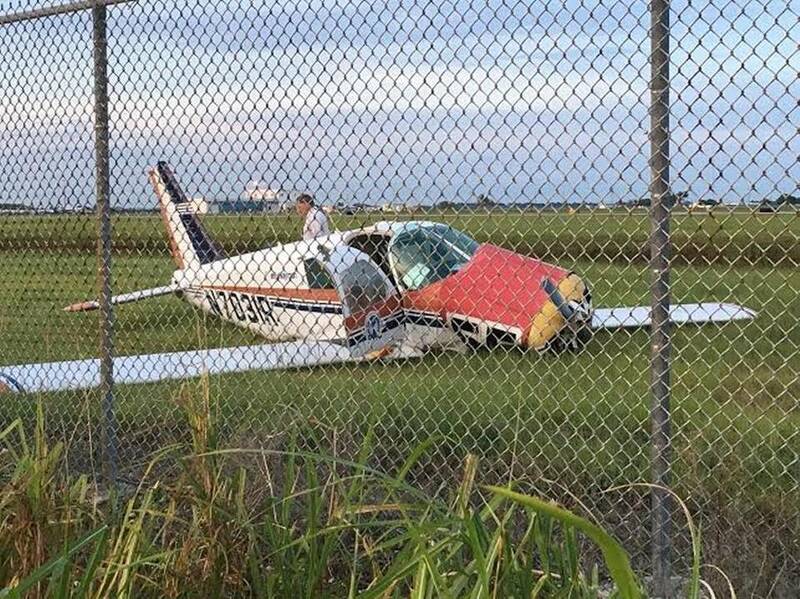 The Federal Aviation Administration said Monday the Piper PA/28 had only two people on board. Greg Chin, a spokesman for Miami-Dade Aviation Department, said the plane was coming from Miami Executive Airport. Investigators were there into the night collecting evidence on what may have caused the fixed single-engine plane to go down. According to FAA records, the plane, which was built in 1966, was registered to Sandy and Santiago Gonzalez.